Whilst the Turkish Grand Prix was an action-packed affair that doesn’t mean we weren’t keeping an eye on goings on further afield in the wide world of motorsport. This is Badger’s weekend digest of non-F1 activities, featuring angry NASCAR drivers and the shock that is a Sebastien Loeb win in the World Rally Championship. Beginning with the closest thing to F1, GP2 kicked off at the Istanbul International Circuit this weekend, with Romain Grosjean and Sam Bird leaving Turkey as joint championship leaders. The feature race fell to poleman Grosjean. He was never really troubled, though Bird kept him honest throughout. Sam edged the gap down throughout the final laps and was particularly close in the final few corners but Grosjean put his car in all the right places to seal the win. The pair were in a class of their own and eventually finished a mammoth 30 seconds clear of third place man Jules Bianchi. It wouldn’t be GP2 without a mega first lap crash – here’s how Fabio Leimer’s race ended on Saturday. Sunday’s feature race was won by Monegasque Stefano Coletti, a stellar result for the Trident driver. Grosjean meanwhile was left playing catch-up by a first lap collision, whilst Sam Bird starred to take third at the flag. That was enough to leave him level with the Frenchman on 13 points at the top of the championship standings. There was another big shunt in the sprint race too, Italian Davide Rigon badly injuring his leg following a collision with rookie Julian Leal. We wish the Ferrari Academy driver a speedy recovery. One level further down we have GP3, where there was a surprise star in Dutchman Nigel Melker. 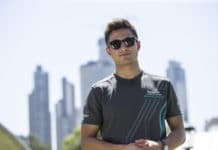 He only scored five points in last year’s GP3 championship, but he doubled that tally in the opening race of the 2011 campaign by winning Saturday’s feature race at the Istanbul circuit. Andrea Caldarelli and pole-sitter Tom Dillmann completed the podium, with Alex Sims the top-finishing Brit in eighth. That gave Alex pole for this morning sprint race, and the 22-year-old made the most of the advantage by taking a win in his first weekend of GP3 competition, eventually romping home over seven seconds clear of Dane Michael Christensen. Melker worked his way from eighth on the grid to take third at the flag, giving him the championship lead heading to round two in Spain. Getting decidedly more American – and infinitely more feisty – we move on to NASCAR. Home of real men? Men who fight? Oh yeah! Regan Smith scored his first Sprint Cup Series win, defeating Carl Edwards at Darlington Raceway in race that lasted just under four hours. Woof! But the real fireworks came after the race, when Kevin Harvick attempted to punch Kyle Busch following some on-track fisticuffs between the pair. The duo had been battling for eighth when Harvick apparently tried to run Busch off the road, with a number of further altercations boiling Harvick’s blood to lethal levels. Busch kept comparatively cool. When they arrived in the pits Harvick stopped in front of Busch, exited his car and proceeded over to his rivals machine to – and we’re not dressing this up – thump him. Busch sensibly/wrecklessly put foot to pedal, pushing Harvick’s vacant car out of the way and in to the wall. Kevin gave chase on foot but never managed to get to Busch. Unsurprisingly, both men were called before series officials, who probably thanked them for the boatloads of publicity such stunts produce. On to the more serene world of endurance racing, which sometimes resembles a retirement home for mildly successful F1 drivers. The Peugeot of former grand prix racers Alex Wurz, Marc Gene and Anthony Davidson took victory in Saturday’s 1000km of Spa-Francochamps, heading the sister car of Stephane Sarrazin, Franck Montagny and Nicolas Minassian at the legendary Belgian circuit. Afterwards, Gene was quick to praise former Benetton and Williams man Wurz, who’d carved through the field in the early laps. It was a perfect Le Mans warmup for the French marque, with the top finishing car of fierce rivals Audi taking third in the hands of Allan McNish, Rinaldo Capello and Tom Kristensen. Finally, it’s the WRC, where seven-time champion Sebastian Loeb cemeted his place at the top of the standings with his second win of the season at the Rally d’Italia. The Frenchman/rally god beat Finn and nearest championship rival Mikko Hirvonen by a little over 11 seconds on the dusty Italian roads with enchanted wood nymph/rally driver Petter Solberg completing the podium. So, just as in F1, a man named Seb who runs in Red Bull colours and drives the best car leads the standings. Grand Prix racing and World Rally aren’t that different after all, folks. Next articleJoin us for the Canadian Grand Prix LIVE in London!